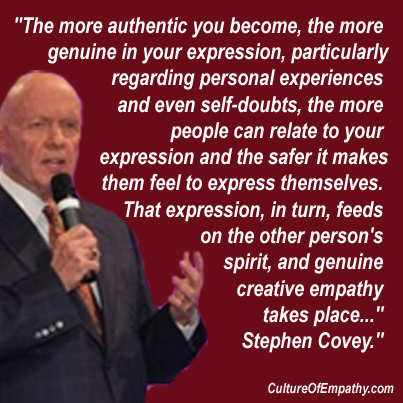 "Stephen Richards Covey (October 24, 1932 – July 16, 2012) was an American educator, author, businessman, and keynote speaker. His most popular book was The Seven Habits of Highly Effective People. 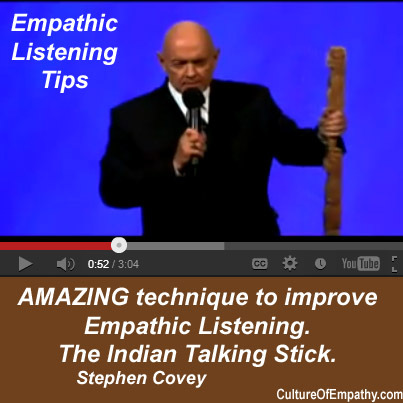 How to do empathic listening and an example. 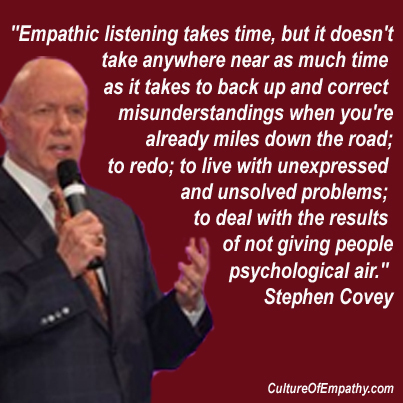 Using Empathic Listening to Collaborate - Stephen R. Covey. 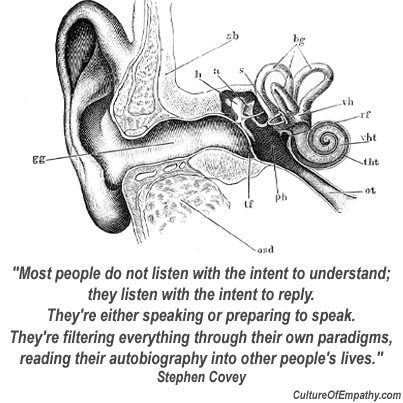 "When I say empathic listening, I am not referring to the techniques of "active" listening or "reflective" listening, which basically involve mimicking what another person says. That kind of listening is skill-based, truncated from character and relationships, and often insults those "listened" to in such a way. It is also essentially autobiographical. If you practice those techniques, you may not project your autobiography in the actual interaction, but your motive in listening is autobiographical. 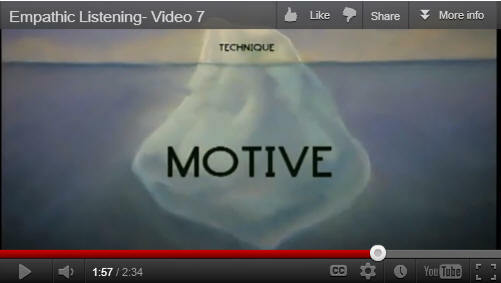 You listen with reflective skills, but you listen with intent to reply, to control, to manipulate. 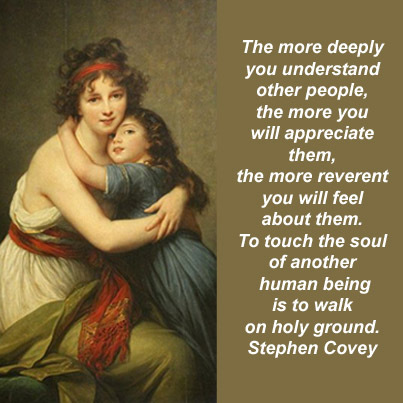 When I say empathic listening, I mean listening with intent to understand. I mean seeking first to understand, to really understand. It's an entirely different paradigm. 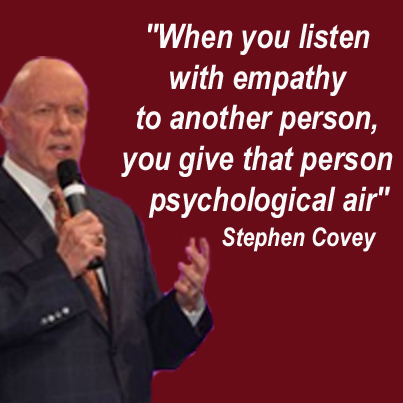 Empathic (from empathy) listening gets inside another person's frame of reference. You look out through it, you see the world the way they see the world, you understand their paradigm, you understand how they feel..
"Empathic listening takes time, but it doesn't take anywhere near as much time as it takes to back up and correct misunderstandings when you're already miles down the road; to redo; to live with unexpressed and unsolved problems; to deal with the results of not giving people psychological air." 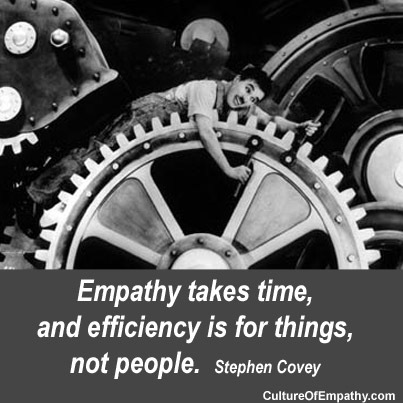 Empathic listening is so powerful because it gives you accurate data to work with. Instead of projecting your own autobiography and assuming thoughts, feelings, motives and interpretation, you're dealing with the reality inside another person's head and heart. You're listening to understand. You're focused on receiving the deep communication of another human soul." to listen, unless I have the desire, it won't be a habit in my life. in business meetings us this - restate the other persons point to their satisfaction. not trying to take control or manipulate toward some worthy end. If you're not sure if you understand the content - restate it.